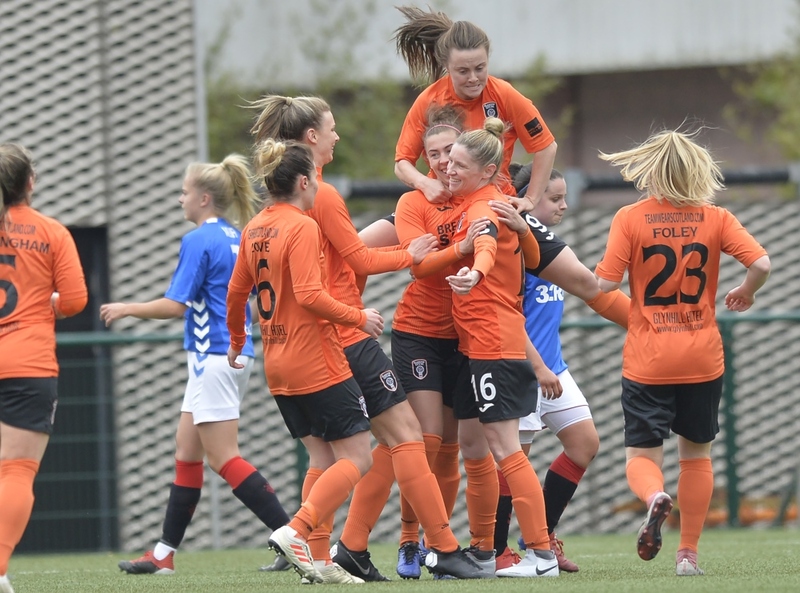 A commanding performance by Glasgow City in Sunday’s 5-1 SWPL Cup Semi –Final win over Rangers earned Scott Booth his 100th win as Head Coach. After a disappointing 4-1 defeat in the league to rivals Celtic last weekend, it was Rangers who looked to grab the opening chance with Chantelle Brown and Nicole Pullar working together to offer Amy MacDonald’s side a bright start to the clash. Possession switched hands shortly after, and Kirsty Howat saw the host’s first attempt at goal hit the side netting. City broke the deadlock eight minutes into the game. 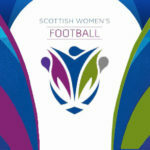 The Rangers defence successfully cleared a corner; however the ball reached Nicola Docherty who smashed a volley on her weaker right foot into the top corner of the net to grab the first goal of the match. The visiting side looked to make honours even when a throw in was met in the box by a header from Caitlin O’Hara, although it failed to trouble Erin Clachers in the goal. Scott Booth’s team pressed after that opportunity and won a corner when Ramsey saved a Jo Love shot. Following the set piece, the Rangers defence struggled to win the ball off Clare Shine. Ellis Dalgliesh eventually managed to hit the ball off the striker; however it landed towards Docherty who unleashed a rocket volley which into the roof of the net to double City’s lead. 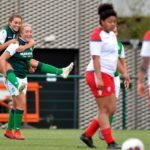 It became 3-0 in the 26th minute when Kirsty Howat flicked the ball past the keeper after Rangers struggled again to clear a corner. The tie was effectively over six minutes later, when Clare Shine struck an effort from the edge of the box that was parried by Ramsey and ended up in the back of the net. Unfortunately for Shine, she picked up an injury following the goal and was taken off to be replaced by Jordan McLintock. The leaders started to slacken in the closing stages of the first half, and Rangers eventually found a way back into the game during injury time. After City failed to fully clear a corner, O’Hara hit a shot from long range into the net to cut the lead down to three goals as the half time whistle blew. 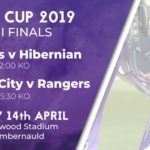 The final goal of the game arrived in the 51st minute when Leanne Ross hit a curling effort from the 18-yard line into the back of the net to complete the rout for Glasgow City, who will meet Hibernian in the final, which will be held at the Pennycars Stadium in Airdrie on Friday 10th May. After the game, winning manager Booth insisted that his side have to maintain their lead at the top of the league by winning games and hopefully go one better and beat the Leith side in the final.